This is the biggest attack on the NHS you've never heard of. Called Sustainability and Transformation Plans he has split England into 44 areas - called 'footprints'. Each 'footprint' was told in late December in 2015 that they must have a plan by 30th June 2016 to completely change the way the NHS works. To work they had to be able to prove they could clear their massive debts within a year. To do that they have to close services and sell land and hospitals. There was a link to TTIP. Now he's in charge of our NHS! He is driving through a change which will eradicate our NHS and replace it with a US style health service. These new organisations could even be run by US corporations, holding the budgets and deciding what care will be provide and who can get it. This is what the Sustainability and Transformation Plans are doing to our NHS. See blogs.bmj.com/bmj/2016/08/05 and Updates, below. TOGETHER WE CAN MAKE THIS A MILLION SIGNATURES FOR THE NHS! The underhand deceit of these plans should be challenged. If the NHS isn't safe in their, hands, then their hands should be permanently off the NHS. with no opportunity for debate or discussion by our elected MPs. The proposed changes seem to allow ANYONE to provide GP services through an Integrated Care Provider contract. The Department of Health’s Directions about this explicitly note the OMISSION of any list of those who are ineligible to provide primary care services. and asking the Supreme Court for permission to appeal. Last-minute scheduling because the Court of Appeal has expedited our hearing due to its urgency and public interest. So this means finding an available slot for us - rather than the normal process of scheduling, which would involve a long wait. There is also space inside the court for people to attend on each day. In Leeds the courtroom was packed with campaigners and this was very inspiring. This is the last chance to stop Accountable Care contracts. We cannot let this chance slip away. We need to reach our initial target of £12,000 by the 21st of October. So we appreciate all your help. 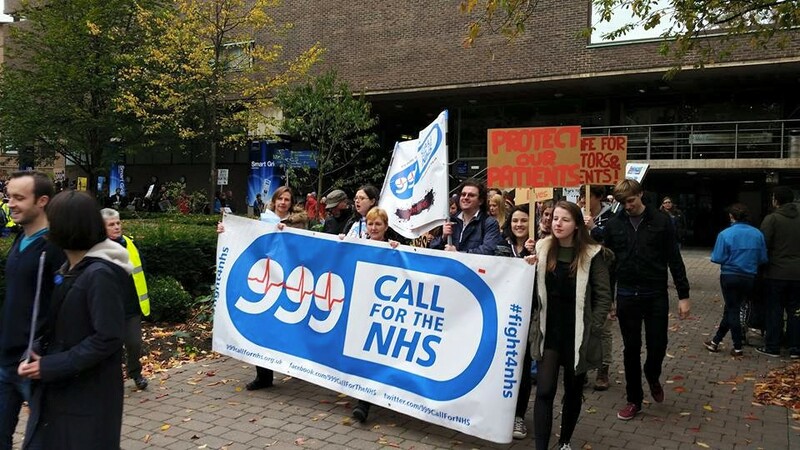 We need to raise £18,000 to cover the costs of our #Justice4NHS Appeal. Over 1400 people have helped get us this far, by crowdfunding the costs of our Judicial Review & Application for Permission to Appeal. We hope you will help us continue with the fight for our NHS. The move to centralise Hyper Acute Stroke services is going on in all the STP rebranded as Integrated Care Systems/Organisation areas. Matt Hancock is the new Secretary of State for Health and Social Care. He likes tech and has received substantial donations from a think tank the IEA which opposes a publicly funded healthcare system. Jeremy Hunt is now the longest serving Health Secretary in history. Dr Louise Irving who came a close second in his constituency at the last election, gives an interview on Sky. 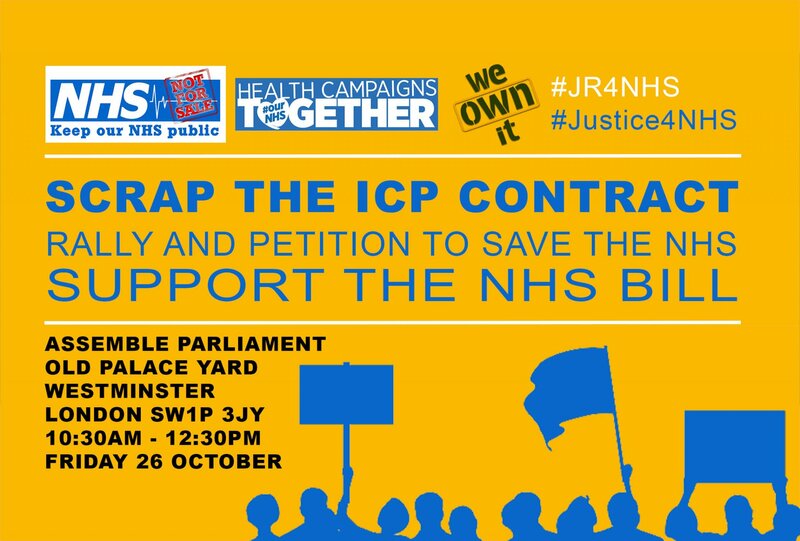 The team who launched the Judicial Review against the new NHS contract published last August, is seeking permission to appeal the ruling it got on 24 April 18. Simon Stevens supported the TTIP proposals for US involvement in the NHS. The NHS has a huge infrastructure of hospitals and buildings. These have previously been 'owned' by the NHS and they were not for profit ie. no rent needed to be paid. Now there are Public Private Partnerships and these are for profit, and rent. Why? "After hearing our argument that the ACO policy is unlawful - and NHS England's and the Secretary of State's arguments that there's no policy outside the proposed contract which is just another contract, that there's no duty of transparency in these circumstances, and that the judicial review challenge is both too early and too late - Mr Justice Green reserved judgment. Jenni Richards QC for the claimants made clear that the case raises fundamental questions about the future of the NHS, rather than being about the technical issues emphasised by the defendants, and the judge said he wouldn't be rushing to put out a judgment, so it'll be a while yet before we know his decision." The odds were not in the claimant's favour in the Judicial Review. The ruling displays too many serious flaws. The Judicial Review happened yesterday and we are now waiting for the ruling which could take weeks. Both this review and the next one to be heard on 23rd and 24th May have significantly slowed NHS England's plans for dismantling the NHS evidenced by the fact that the Dudley contract has not been awarded and the Manchester one also is on hold. However, there is an ominous development, mentioned in this article which intimates Government is going to announce changes to Health and Social Care later this year. Why is there a Judicial Review on 24 April 2018? Here's an explanation. "Yet because ACOs are to be established by a commercial procurement process their legal form cannot be specified. They can be partnerships that include private health and care providers, and private insurance and property companies, which will make money from charging. We could easily end up in a situation where it is in the financial interest of an Accountable Care Organisation to progressively reduce care provided free from public funds, in favour of means tested care packages." These on the map were due to 'go live' this month (April) but NHSE has mandated they are not to issue the new contracts until after the Judicial Reviews and consultation. GPs are now at risk from NHS funded, for profit companies who cherry pick their healthy patients, and thus reduce their lists and therefore funding. Please read this useful leaflet from Keep Our NHS Public. GPs are now at risk from for-profit companies cherry picking their healthy patients and reducing their lists (and therefore funding,) to those who need more services. When they can not afford to stay open, more GPs surgeries, especially in London, will close. Please read this very useful leaflet from Keep Our NHS Public. GPs are now at risk from NHS funded companies who cherry pick healthy patients. Keep Our NHS Public has produced an explanatory leaflet. Boycott GP at Hand. Hospital chiefs said that some highly-paid surgeons had been out of action for four or five weeks because of the cancellations. There were no beds for recovering patients, the article says, but even so, up and down England the move to reduce bed numbers still further, continues. The Health Select Committee invited representatives from groups challenging the newly named Integrated Care Systems (formerly Accountable Care Systems) to present evidence. Said someone afterwards, " It was not a meeting of minds." See what happened here. NHS Improvement, which is being set up with its values and culture, by KPMG according to Private Eye, has gone into partnership with US Virginia Mason Institute. Are SubCos a secret way to transfer £millions of buildings and land into private companies? that provides services to over nine million patients across England. Watch from 9 minutes as a campaigner explains the impact of hospital closures in Devon. Integrated Care Systems, which is what the footprint plans are now known as will increase outsourcing to services out of hospitals. Please tweet and use on leaflets and letters to the papers. Thank you. Is an A&E being closed or downgraded near you? This is what will be lost if so. Who has taken back control exactly? Donald Trump tweeted about the demonstrations... he's very interested in getting more contracts in the NHS, for United Health, Hospital Corporation of America and exporting so-called expertise from Virginia Mason hospital Seattle. We say no thanks! LATEST DEVELOPMENT!!!! The HSJ (Health Service Journal) reported on 2 Feb that NHS England has 'rebranded' Accountable Care Organisations as Integrated Care Organisations or Systems. Campaigners were waiting to meet Jeremy Hunt when he arrived in Brighton today. A courageous junior doctor speaks out. 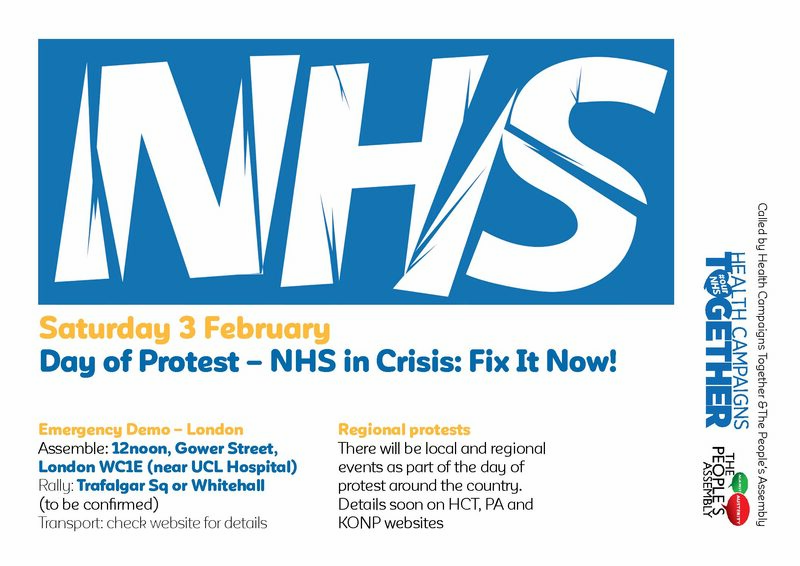 The RCN is supporting members in England, to attend the march in London on Feb 3rd. Nationally it is rumoured that 15,000 beds have been cut since 2010 and more to go. The new crowd fund page has gone live, to raise 12k for the Judicial Review . Please support if you can. Jeremy Hunt MP has been reshuffled to the minister for Health and Social Care. So he is minister for Accountable Care Organisations, (ACOs) of which we know there are 31 now. We need to use all available means to protect and safeguard the NHS and healthcare for everyone. This is why we are launching our “act local, think national” #NHS4ALL resource page for January - April. Local NHS groups around the country are already taking action in all kinds of ways to protect the #NHS4ALL. We hope the #NHS4ALL campaign resources will be helpful. Another wholly owned subsidiary of an NHS Trust goes ahead. called for in Carter’s review of Operational Productivity. On Thursday 21st December 999CallfortheNHS lawyers, Leigh Day, informed them that a judge had considered their papers and those of NHS England... and granted permission for their JUDICIAL REVIEW to go ahead at some time after 16th February 2018! This is wonderful news and a real present just before Christmas. This is an explanation of Accountable Care Systems using Cornwall as an example but it could be many other places with similar demographics. Twitterstorm Thursday 7th. Find out more about ACSs: not instigated by us but worth a look. Thanks to information people have sent us we now know of 24 Sustainability and Transformation Plans which are due to turn into Accountable Care Systems in the near future. Is this a TTIP type legal suit about loss of future earnings? Virgin Care gets undisclosed sum for not being awarded an extension to it's contract! And here is news of a 'partner' in the West Yorkshire Sustainability and Transformation 'Partnership', soon to be Accountable (or Accountant-led) Care System (ACS). Here is a 'partner' in the Surrey Sustainability and Transformation 'Partnership'. Having to go home in a taxi following open heart surgery would be dangerous and a possible outcome may be sudden readmission. What have we become, to condone this? At the meeting the CEO representing the 3 Leeds CCGs commented that the 3 Leeds GP Federations, were going to remain 3 Federations and not combine or merge in the same way as the Leeds CCGs were working together. However he hinted that there may be on overarching 'umbrella' organisation, to keep then together, in the future. Why did I think of Sodexo facilities management company, in the meeting? Strange! Are you in one of the 8 areas fast tracked to being an Accountable Care System or Organisation? This is what it means for patients. A packed public meeting in Ludlow where people tell Philip Dunne MP that they do not want the closure of their local Ludlow hospital. Stage 2 of a legal challenge, to stop the new contract for the STPs as they become Accountable Care Systems and Organisations, also called Multispeciality Community Providers.. The latest money making STP wheeze in Southend seems to be driven by conflicts of interest. 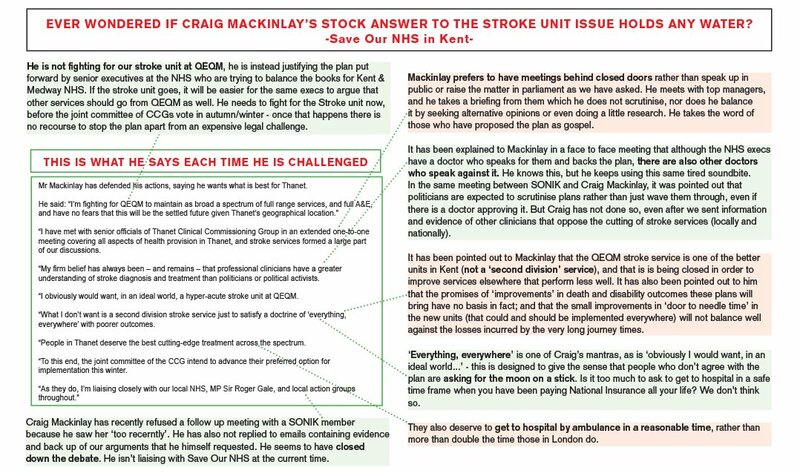 Southend Save NHS campaign says "The Care Rooms company is advised by former NHS England Director Mike Bewick – who co-incidentally is also the Independent Chair of the Mid and South Essex Success STP. This is just another example of our local STP attempting to cut costs at the expense of people’s care. " Campaigners buoyed up by the success of the Horton Hospital Judicial Review. How come in the US in 2014, the third most likely cause of death was preventable medical error? Concerned Doctors trying to improve outcomes there, always come up against the stumbling block of 'Commercial Confidentiality.' Companies will not disclose their procedures or practices in case a competitor sees them, therefore scrutinising doctors on examining committees, do not know how they can put these said practices right. This may begin to happen here in England, as more and more services are 'outsourced'. Listen to a member of the public talking eloquently about Dorset cuts. In West Yorkshire 3 members of the local 999 Call for the NHS group, handed in a letter to the West Yorkshire and Harrogate Joint Health Overview and Scrutiny Committee, which should be scrutinising the STP plans, asking them to meet! Hospital closure plans continue. Dorset, currently has 3 acute hospitals, all with A&E and Maternity, and they need them. There are 13 Community Hospitals with beds across what is a large County much of it rural with very poor public transport links. On 20th September Dorset CCG voted to close Poole A&E and Maternity (the one with the highest footfall in the middle of the County), require Dorset County Maternity in Dorchester to share their consultant and paediatric beds with Yeovil Hospital in Somerset, close Ferndown and Alderney (Poole) Cottage Hospitals, reduce Wareham and Portland Community Hospitals to 'hubs' with no beds, and close the 15 bedded Linden Mental Health unit in Weymouth. This is a brilliant video about the Save Rothbury Hospital campaign and the shockingly devious and negligent actions of bosses in the Clinical Commissioning Group and local NHS hospitals Trust. The fight to save our community hospitals is every bit as important as the higher profile fights to save our District General Hospitals and their A&E departments. Thanks Martin. It is a measure of how much NHS England do not want us to know the costs of 'marketisation' that they have no mechanism of how to calculate the costs or even to know what companies are working under the NHS logo. Academic Allyson Pollock who has expertise and resources to study such things, can only estimate between 12-30% on transaction costs of the market and that is without PFI costs and the high price of drugs. Dr Tony O'Sullivan introduced as co-chair of KONP BBC News Channel, in studio to debate the NHS Provider appropriately placed bombshell that the Govt must find urgent £250-350m to stave off winter disaster. The KONP interview follows the interruption. Thanks Deb. The really scary thing is that American HCA healthcare, will potentially have a say in how the whole system for Birmingham is organised, not just the hospital.... so lobbying to have NHS facilities in all fields downgraded, to suit their business model would be easy. Let's stop it! University Hospitals Birmingham Foundation Trust can now proceed in its deal with American private company HCA Healthcare to build a £65m new hospital on trust land. The Competition and Markets Authority has cleared the move. So Birmingham has, potentially a new US provider on it's STP Programme Board, driving the changes to local provision with a fixed budget. Who gets first dibs at the profits do we think, patients, or shareholders? The complex financial structure likely to be involved as a PFi type deal and additional bureaucratic costs needed to service it, point to a poor financial outcome for the NHS Trust as a result, but it does fulfill the recommendations of the Naylor Review, because HCA Healthcare is to build the new hospital at the Trust’s Edgbaston campus! Care in the community was a phrase that got damaged because of mental health care not being there, but now, we're being told hospitals for other illnesses are 'old fashioned.' What rubbish. Barbara S says " - personally I have just received a letter from a private company inviting me for a private costly health screening. The way my address is presented suggests that the local GP surgery may be behind this. Doubly concerning: Did they sell addresses? Are they no longer offer screening as part of preventative medicine? " We say this is a question which you need to ask. It seems that surgeries and pharmacies can sign patients up to electronic delivery of prescriptions without their knowledge and med-confidential is very sceptical of the SystmOne GP online prescription ordering service. Stephen Hawking says, "The question is whether democracy can prevail and the public can make its demands for proper funding and public provision undeniable by any government." The HSJ has just revealed that the East Midlands, Nottinghamshire and Nottingham STP has recently contracted Capita to help with the setting up of its Accountable Care System. Remember 'accountable' means for the money, not people's treatment. Capita has in turn subcontracted part of the contract worth £2.7m to a company called Centene, which is part of a major insurance company Centene Corporation which sets up care plans for Medicare and Medicaid in the US. It has worked with the Spanish Healthcare provider Ribera Salud on its Alzira ACS in Valencia, according to the HSJ. It's all about the 'marketing'. We've heard about Special Purpose Vehicles(SPVs) in relation to new build Hospital, Public/Private Finance Initiatives (PFI) which have proved to be such poor value for the taxpayer. At last, ......concrete evidence that the Government is instigating hugely costly and inefficient Public Private Finance Schemes for medical services as well as buildings, maintenance and cleaning etc. through the STP arrangements. Here is where you can see NHS England's spreadsheets with their criteria for assessing STP progress, and their ratings for the progress of each STP. They are now "Partnerships" not "Plans" and the "advanced" ones will soon been "Accountable Care Systems", on the way to becoming "Accountable Care Organisations", and the rest are to follow in their footsteps. "Members of Southend's successful campaign to stop the downgrading of their local A&E department join forces with the Buzby and the Fruit & Veg Kids to create an anthem of hope for our beloved NHS and all the fantastic people who work for it. Let's see if we can get this in the charts by next Sunday!! (20th August)"
The adult congenital heart service at the Manchester Royal Infirmary has 'collapsed' under the government's supposedly beneficial STP's. Please sign our petition. However this report, is the US trying to increase access for the poor and vulnerable in America. Simon Stevens, CEO of NHS England is on the board of the Commonwealth Fund, which is a private foundation. In this report, what is arguably the most important measure of all, healthcare outcomes, the NHS come next to bottom, just above America which scores worse than any of the 11 countries used for comparison. Dorset is one of the 8 Sustainability and Transformation Partnerships that NHS England has fast tracked to turn into an Accountable Care System. It is planning savage hospital cuts and the imposition of unevidenced care in the community instead. Hunt recently pitched up Poole and Bournemouth Hospitals to discuss the Dorset Sustainability Plan but refused to meet press and public. So much for democratic accountability. Less than a quarter of local politicians are confident that major NHS plans to reshape local health and care services will succeed, according to a new survey by the Local Government Association. "Hospital Trusts in the 14 most underfunded NHS areas have staved off about half of the £470m cuts that NHS Improvement and NHS England ordered them to make, through the new Capped Expenditure Programme that was imposed in April this year". The Naylor Report expects Public Private Partnerships, being hatched way down under the radar by ‘Project Phoenix’, to be the route to private capital. These new Public Private Partnerships will be worth £3bn-5bn. Letter from CEO of NHS Improvement to "All Provider CEOs engaged with the Capped Expenditure Process." Accountable Care Organisations are now up and running in Northumberland and in the process of being introduced in North Tyneside driven by the CCG deficits due to underfunding. Theresa May fully supports the proposals in the Naylor Report which incentivises Hospital Trusts to sell their land at a lower than market price. See link. These proposals must be built into the Sustainability and Transformation Plans, or the Hospital Trust will not have access to public money. People in Britain risk losing their “fundamental right to health” after Brexit, a barrister and public health professor have warned. The next phase in our campaign has begun. We are challenging the STPs in the courts. Our crowd funder is now live. Details in the link. NHS detectives will be in Huddersfield on Saturday 29 April in St Georges Square HD1 1JS from 10:30am. Join us for the Huddersfield march for the NHS. "We cannot let the NHS serve us with less hospitals and staff than we already have. After Brexit there should be much more funding available to the NHS so why start talking about reducing it NOW!. Join the petition if you agree." American Corporate Foxes to ransack NHS henhouse in £3bn - £5bn privatisation. Unfortunately for us, Mrs May is choosing not to put enough money into the NHS, but this is part of the plan to dismantle it. Hammond's economic plan for the NHS, through the Sustainability and Transformation Partnerships as they now are...is to bring hedge funds and international capital into its very heart. Thus draining it of life blood for very many years as the interest has to be paid...for 30 years, 60 years? Tentative deals have been drawn up with a number of hedge funds and investment companies, reported the newspaper – but these can only go ahead with Government approval. Do we approve? WE DO NOT! About as close to terrorism without actually bombing your own country. It's contract killing made legal for Govt and companies to make a fast buck. What other way is there to see this? Is there no concern for the population, or the country? It should be made clear that NHS England under Simon Stevens, has embedded private companies in the deep structure of the NHS, with for-profit companies 'helping' CCGs with their commissioning roles. At the top of the list with the most influence is United Health, and American health insurance multinational, which also has a subsidiary providing services. United Health is NHS leader Simon Stevens', former employer. A parasite is an organism which the host does not recognise as a danger. These companies have specialities. One, BDO is an expert on insolvencies. Now when will that come in useful? In November 2016 David Mowatt MP Under Secretary of State for Community health and Care said at the National Children's and Adult Services Conference, that the Footprint STPs would not go ahead "if councils believe they have been marginalised." At least 26 Councils now oppose their 'footprint' STP. Primary complaint? They were marginalised. Sign our letter asking David Mowatt MP.... "Have you stopped these STPs?" Although TTIP is just about defunct, CETA is still very much on the table. Now Trump has the upper hand and wants more of his Corporations to muscle in on our health care. The STPs make this much easier for them. Stop the STPs. Tell your friends, share the petition. The big NHS Demo in London tomorrow is concentrating minds....however we must not let the simple call for more NHS funding, to take our minds off the real reason for concern, which is the NHS service redesign to suit profiteers. Simon Stevens is getting worried and reporting that he is asking Trusts not to cut any more beds until Care in the Community can be demonstrated to be reducing hospital attendance. This was reported yesterday in the Times as well (with a paywall). Which company wrote the STP document for your footprint? Attain wrote the one for West Yorkshire footprint number 5 and now we find Pricewaterhouse Cooper (PwC) involved in Lincolnshire. Has your hospital reconfiguration been referred to the Independent Reconfiguration Panel(IRP),the Chair of which is hospital reconfiguration advisor to PwC it seems? As predicted in our petition started last May. While the press kept everyone talking with the 'dead cat' strategy of immigrant charges, news was quietly slipped out about 1 in 6 A&E closures or downgrades. 38degrees new research, picked up by ITV amplifies what we've been saying since May 2016. Please sign up for the 'Thunderclap'! The social media 'reach' in December was a million people! Even if you can't attend an event, your social media involvement will be very helpful. and check event on FaceBook for updates as even if you are not signed up to Facebook, you should be able to see the page. New Howls on 28 Jan 2017. Sharing the social media links will be a great help. Thank you. We're delivering a letter to NHS England asking the Board Chair and members to resign, at the Leeds Howl. Sign it by 10pm 22 December to be included! The map in this link is being updated daily with new STPs for areas, as they are published. Check out our website for the 'flatpack' campaign materials to customise for your area. Many news items are restricted to local newspapers and news sites. It is indicative of how much ordinary people don't know about the fragmentation and profit making companies in the NHS, when you watch this film. 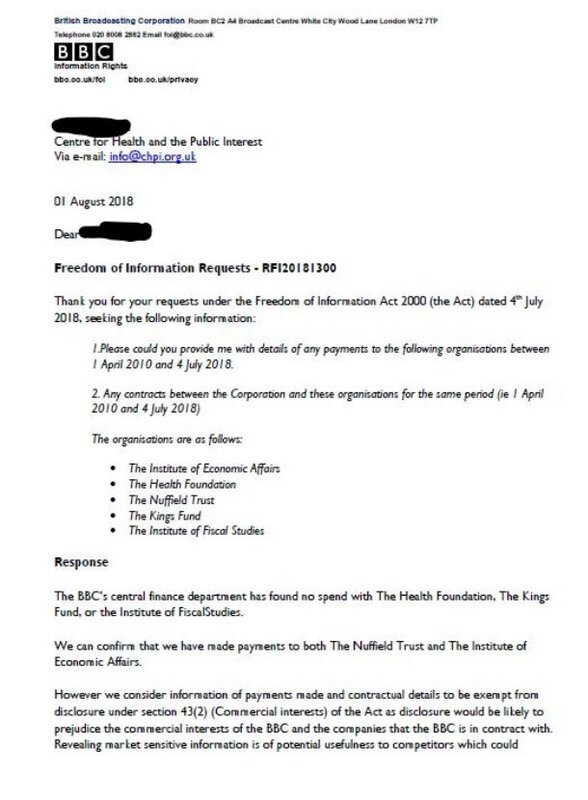 The letter in the link above, shows that the NHS Providers, ie NHS Trusts and Foundation Trusts want to have the freedom to cease to provide comprehensive services due to the lack of money. This is like asking to abolish what the NHS was and is still supposed to be! Today, the media storm about MP Sarah Wollaston's exposure of his erroneous claims about injecting £10bn into the NHS erupted in the newspapers and online. Sarah Wollaston MP, chair of the Health Select Committee, exposes Jeremy Hunt's duplicity. The research highlighted in this report indicates that the Government's sudden shift to widespread use of the private sector is a "radical" experiment, which has the potential to go "catastrophically wrong."